Sara B. Friedman’s practice focuses on all matters of matrimonial and family law, including complex divorce and custody proceedings, and she appears regularly in both the Family and Supreme Courts. Sara has practiced matrimonial and family law almost exclusively since her graduation from law school. She developed a passion for the field while working as an intern and paralegal in the Matrimonial and Family Law Unit of the New York Legal Assistance Group for nearly five years prior to attending law school. Sara continued to pursue her interest in matrimonial and family law in law school, when she interned for a variety of legal services organizations, including the Children’s Law Center, the Legal Aid Society, and the New York Legal Assistance Group, representing parents and children in custody, visitation, family offense, and juvenile delinquency proceedings. While in law school, Sara received the Center for Computer-Assisted Legal Instruction (CALI) Award for Divorce Mediation and was a member of the Moot Court Honors Society. She was also selected as a Brooklyn Law School Students for the Public Interest (BLSPI) and Public Interest Public Service (PIPS) Fellow. 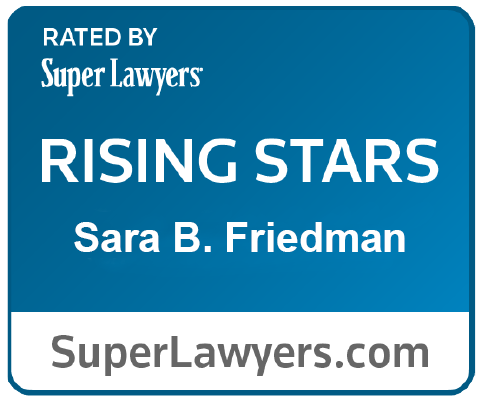 Sara was named to the 2018 New York Metro Super Lawyers Rising Stars list.